Can you feel the excitement in the air? That's because the launch date of the Pixel 3 phones, the 9th of October, is fast approaching – and what you're probably wondering is how these new phones are going to stack up against the existing Pixel 2 and Pixel 2 XL. Well we're here to tell you, though we are of course relying on leaks and rumours rather than hard, solid, confirmed facts about the Pixel 3 and Pixel 3 XL. Are they going to be worth the upgrade? Can they best the iPhone XS and iPhone XR? Read on to find out. PS5 or Xbox Two: which will win the next-gen console war? This year Google is expected to follow the same design template as last year: one smaller phone (without a notch), and one bigger phone (with a notch). Presumably it worked well enough in 2017 that we're going to see the same formula repeated this time. Last year the screen sizes were 5 inches (Pixel 2) and 6 inches (Pixel 2 XL). On the 9th of October we're expecting those sizes to get a little boost to fit in with the continuing trend of ever-larger smartphones – 5.4 inches on the Pixel 3 and 6.2 inches on the PIxel 3 XL, if the leaks are to be believed. Reductions in bezel sizes might mean the phones end up being the same size overall, though. The two-tone colour scheme from the Pixel 2 phones is apparently being carried over to the Pixel 3 handsets, though there have been hints that the "kinda blue" colour is going to make way for a mint hue, sitting alongside black and white. That display notch, apparently coming to the Pixel 3 XL, could be the biggest conversation starter when it comes to these phones – the Pixel 2 XL didn't have one, and nor did the Pixel 2. Is Google about to embrace the notch trend? Year-on-year flagship smartphones get reasonable spec boosts from their manufacturers, and we're not anticipating that Google is going to break with tradition here. The Snapdragon 835 chipset inside the two Pixel 2 phones should be replaced with the Snapdragon 845 chipset for the two Pixel 3 phones. That's the same Snapdragon 845 processor that we've seen in many a top-end Android phone already this year, and it should mean the phones that are getting launched next month can keep up with the best of them in terms of performance (and should be comfortably faster than the 2017 phones that came before them). We might not see much movement in terms of RAM – both the Pixel 2 and the Pixel 2 XL offered 4GB of RAM alongside either 64GB or 128GB of internal storage, and we reckon the Pixel 3 and the Pixel 3 XL might closely follow that lead. We might see a slight bump to 6GB and 256GB, but it's not clear what Google has got planned here. In summary – the Pixel 3 phones will be faster than the Pixel 2 phones, as you would expect. The Snapdragon 845 chip is particularly adept at processing AI calculations, something which Google is very fond of, so voice and image recognition should be better than ever on the new phones. 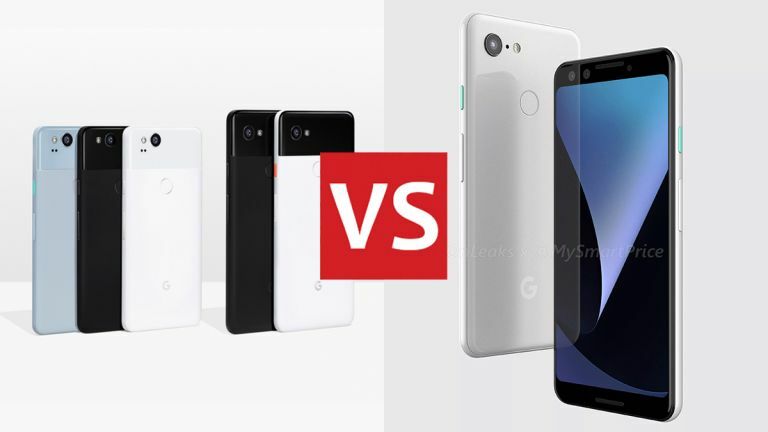 Features-wise, the Pixel 2, Pixel 2 XL, Pixel 3 and Pixel 3 XL should all be largely the same – the two phones we got in 2017 were pretty much identical except for the size, and the sizes and the specs will be the major changes this time around. Other than that, we're not expecting any big new innovations. The rear cameras will of course be better than ever, we would have thought, though it looks like Google is sticking with the single-lens approach around the back – watch out for improvements in the background image processing algorithms, if not in the megapixel count. The forward facing cameras might well get some new tricks for better selfie-taking, and it seems as though the same camera setup will be on both the Pixel 3 and the Pixel 3 XL (the Pixel 2 and the Pixel 2 XL were both matched with the same cameras too). Other features – IP67 waterproofing, USB-C port – are likely to be largely unchanged, though we have heard rumours that this is the year Google will add wireless charging to the mix on its Pixel phones. It would certainly be a welcome addition. The Pixel 3 and Pixel 3 XL are going to come rocking Android 9 Pie right out of the box, though considering the Pixel 2 and Pixel 2 XL have already been upgraded to the same Android version, there won't be any differences from the software side (remember the Pixel 2 phones ushered in Android 8 Oreo last year). You don't need to be a smartphone expert to predict that the Pixel 3 phones will be an improvement on the Pixel 2 phones – the question is, how much of an improvement? It sounds as though the speed and camera boosts this time around are going to be noticeable without being game-changing. Remember that the Pixel 2 and the Pixel 2 XL had the same specs and features – it was only the screen size (and the bezel size) that separated them. We think the same is going to happen in 2018, so if you're choosing between the Pixel 3 and the Pixel 3 XL it's just a question of deciding if you want a smaller or bigger phone (or if you like the notch or not). Whether it's going to be worth upgrading from the Pixel 2 (or Pixel 2 XL) to the Pixel 3 (or the Pixel 3 XL) is likely to be a tough call – unless Google introduces something like wireless charging or a real surprise, you're probably going to be okay for another year. What's certain is that the launch event for the Pixel 3 and the Pixel 3 XL is going to be well worth looking out for, and we will of course bring you all the announcements here as they happen. Google has always wanted the Pixel phones to represent the very best of what Android handsets can be, and 2018 looks like being no different.